I didn’t write a tutorial at the time because I didn’t think there was much of an interest in how to machine darn rips and holes in a garden flag. Based on the number of questions I answered after I did the job it turns out I was wrong. Luckily, I get a second chance to write a flag repair tutorial because the twin outdoor feather banner has a tear and a hole in the same place where flag sleeve (the part where the flag pole runs though) sits on and pulls against the top of the curved metal pole when the wind blows. The client asked if I would repair Flag 2 like I darned the tear and hole in Flag 1 since Flag 1 is still rip, roaring, and ready to fly. 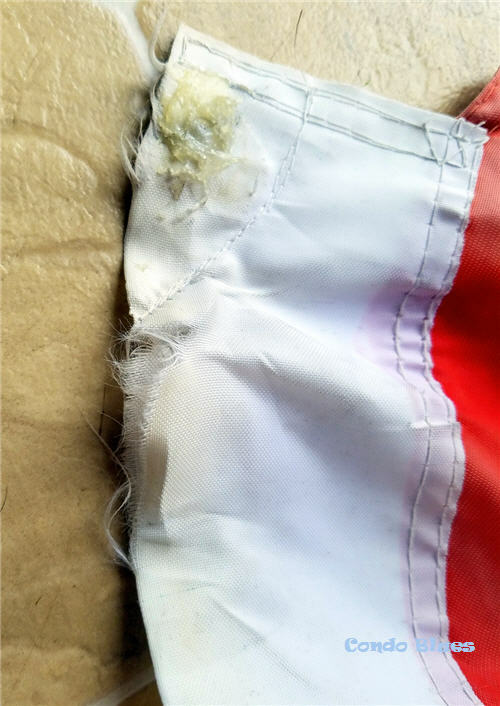 The blob at the top is the client's attempt at repairing the hole in the flag with hot glue. Needless to say it didn't work. Neck scissors – The greatest gift my sister has ever given me that guarantees I never lose my good sewing scissors! 1. 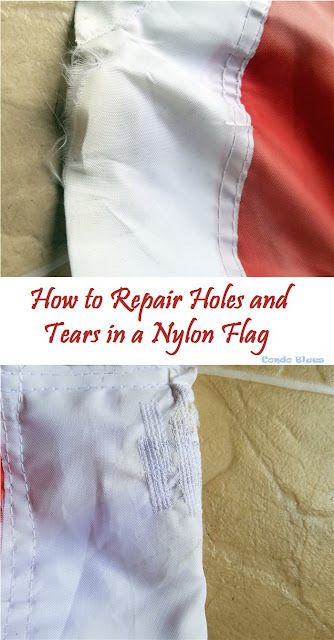 Use the seam ripper to carefully remove the seam at the top of the flag and enough of the side seam so you can lay the damaged fabric area(s) flat under the sewing machine needle. 2. Measure and cut a piece of heavy duty fabric to cover the backside of the damaged area of the flag sleeve. We will use this fabric as a stabilizer which will allow us to darn the holes in the nylon flag fabric closed without shortening it. 3. Use the glue stick to temporarily attach the backing stabilizer fabric to the damage area to what will be the inside of the flag sleeve. Why am I using a temporary glue and not I exclusively using straight pins to hold the backing fabric in place? 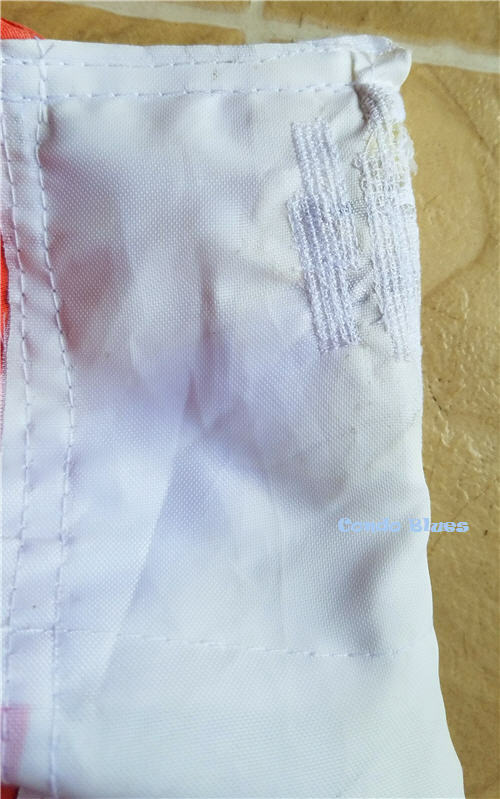 Because a washable glue stick is less messy than using temporary spray adhesive to keep the backing fabric from slipping from the slippery nylon flag fabric while also holding both sides of the ripped fabric together so the machine and sew rows of horizontal and vertical straight stitches on it for the repair. 5. Now you are ready to darn with a sewing machine! Start darning a distance from the hole or rip to reinforce the thin fabric around the hole or rip. This is what the front side of the repaired flag will look like when we finish sewing the rips and holes closed. As tempting as it is to make one long, thin darning stitch the length of the ripped fabric – don’t do it! 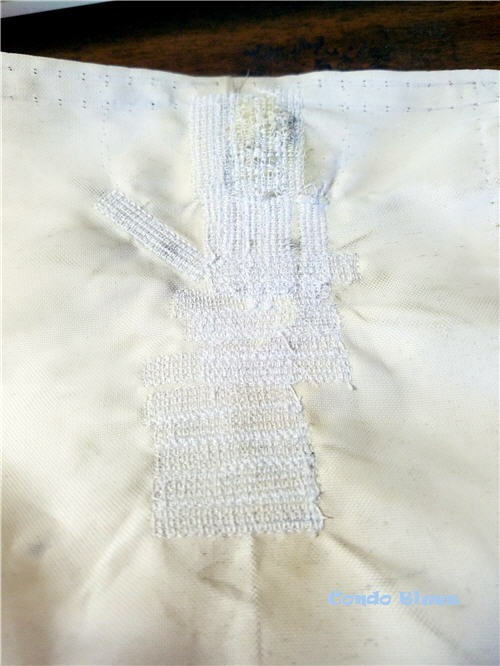 The repair will be much stronger if you work in small overlapping sections and start and end the darning stitches on the stronger fabric area away from the thin and damaged fabric. 6. Once the sewing machine has completed its first set of darning stitches, lift the presser foot of the sewing machine, and slide the next section of fabric under the needle, lower the presser foot, and darn that area of fabric with the sewing machine. Repeat as this process as often as necessary until you have machine darned all of the rips and holes in the flag. This is what the back side (what will become the inside of the flag sleeve) looks like when I finished darning the damaged areas of the flag. You can also use this darning technique to reinforce fabric that is wearing thin so it may last longer before ripping. 7. Use the straight pins to fold the flag sleeve in half and pin it back into its original place on the flag. 8. 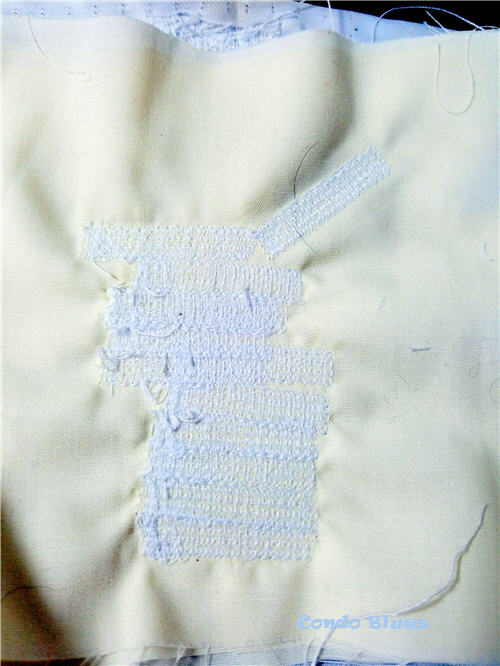 Use a straight stitch on your sewing machine to sew the fabric into place. 9. Let your flag fly! This job took an hour and a half to complete. I know because I streamed the movie A View from the Top (a cute rom com!) while I worked. I finished the job has the credits were rolling. Pin this tutorial for later and share it with your friends on Pinterest!